For the past several years, rulemaking on refrigerants has been at the top of the list of concerns for the commercial refrigeration industry. The Environmental Protection Agency’s (EPA) historic July 20, 2015, ruling marked the beginning of a transition from high global warming potential (GWP) hydrofluorocarbon (HFC) refrigerants to the next generation of environmentally friendly alternatives. From equipment design and servicing requirements to safety concerns and building codes, this transition has far-reaching implications that will take some time to sort out. In our twentieth E360 Webinar, titled “Making Sense of the Latest Rulemaking on Acceptable Refrigerants,” Dr. Rajan Rajendran, Emerson’s vice president of system innovation center and sustainability, assembled an expert panel of refrigerant manufacturers to discuss the latest rulemaking and review the development of acceptable refrigerant alternatives. Rajan was also joined by Shane Angle, Emerson’s vice president and general manager of commercial air conditioning, to discuss the AC side of the equation. Rajan kicked off the informative discussion by providing a background on the types of commercial refrigeration equipment affected by the EPA’s Significant New Alternative Policy (SNAP) rulings, such as stand-alone equipment, supermarket systems, remote condensing units, and refrigerated food processing and dispensing equipment. He then placed the EPA’s actions within the context of the many global regulations aimed at reducing HFCs, including: the Kigali amendment to the Montreal Protocol; E.U.’s F-Gas ruling and Environmental Canada’s recent proposal. Then, with the EPA’s HFC phase-out schedule as the backdrop, Rajan turned the webinar over to the refrigerant manufacturer representatives to discuss the development of new lower-GWP alternatives. The expert panelists included: Matt Ritter, global business director of fluorochemicals at Arkema, Inc.; Barbara Minor, senior technical fellow at Chemours; and Dr. Samuel Yana Motta, director of technology at Honeywell International. Each representative presented the key performance characteristics of their company’s new synthetic refrigerant alternatives as compared to their HFC counterparts, including: GWP, intended applications, discharge temperature, efficiency and capacity. Representatives also presented what they consider as true “future proof” options that have a GWP of less than 150. It’s important to note that to achieve minimal levels of low-GWP, these blends all are classified as A2L, or mildly flammable. The panel also explained that not all of their new refrigerants are listed as acceptable alternatives, though they are working with the EPA through its SNAP program to achieve this designation. Finally, Shane Angle provided an AC perspective, explaining that the regulatory timing — including: A2L standards development by the IEC, UL, ASHRAE and building codes; Department of Energy efficiency standards; and the EPA refrigerant proposal — are driving the need for compressor development to support common AC applications. He closed with a chart that demonstrated the projected global emergence of flammable, lower-GWP refrigerants over the next five years. The webinar concluded with a nearly half-hour Q&A session between attendees and panelists. Judging from the volume and nature of questions, it’s clear that this is a topic that will require continued stewardship as this transition to lower-GWP alternatives continues. Trust that E360 is committed to keeping you informed with every new development. Click here to view the webinar in its entirety and learn more about the latest refrigerant rulemaking. This blog is a summary of the article Countdown to Compliance from our recent edition of E360 Outlook. Click here to read the article in its entirety. With the Department of Energy’s (DOE) 2017 energy efficiency deadline now visible on the horizon, foodservice OEMs will be the first to feel the brunt of the regulatory storm targeting commercial refrigeration. For the last several years, the refrigeration industry has been forced to come to terms with a dynamic and often uncertain regulatory environment. On the one hand, the DOE is mandating significant new energy efficiency improvements. On the other hand, the Environmental Protection Agency (EPA) is phasing out the use of widely used high global warming potential (GWP) refrigerants while sanctioning a growing list of acceptable substitutes via its Significant New Alternatives Policy (SNAP) program. The convergence of these two regulatory fronts has created the perfect storm: a once-in-a-generation occurrence that promises to permanently reshape the commercial refrigeration landscape. This tectonic shift in our industry is creating unprecedented challenges for every segment of the commercial refrigeration supply chain, from OEMs, wholesalers and contractors to design consultants and end users. Foodservice equipment manufacturers find themselves at the leading edge of this transition. March 27, 2017, is the DOE’s energy reductions compliance date for stand-alone commercial refrigeration equipment — an average of 30–50 percent reductions, as measured in kWh per day. Affected equipment architectures include: remote condensing commercial refrigerators and freezers; self-contained commercial refrigerators and freezers with and without doors, as well as open display cases. This means that all new equipment manufactured after this date fall within the purview of this rule. And with the EPA’s decision to phase out commonly used refrigerants, like R-404A and HFC-134a in 2019, OEMs must factor this key design consideration into their engineering equation. What’s at stake for OEMs? One design cycle or two? — When it comes to achieving DOE and EPA regulatory compliance, OEMs face a critical design choice: approach each regulation as a separate engineering effort or combine compliance into a single design cycle. Compressed design cycle — Regardless of the design cycle decision, OEMs will need to allot sufficient laboratory and testing time to make the necessary design adjustments to achieve DOE compliance and to secure requisite UL, ASHRAE and NSF certifications. Civil penalties — The details around how the DOE will enforce the ruling remain to be seen, but past performance indicates that they will be prepared to issue civil penalties. After March 27, 2017, equipment manufacturers who are still offering reach-in units that don’t comply with the DOE rule may be subject to these penalties. Peer scrutiny — As many OEMs will be making significant investments in design changes to achieve compliance, those who are neglecting or avoiding these efforts will likely be subject to the scrutiny of their industry peers. In other words, the industry will also police itself. Registration in DOE compliance database — It’s important to understand that the DOE maintains a database of commercial equipment for compliance called the Compliance Certification Management System (CCMS). Please see: https://www.regulations.doe.gov/ccms. This database is essentially a record of the baseline energy consumption of equipment prior to making the mandated design changes to achieve new energy efficiency levels. Manufacturers who have not listed their equipment in this database may be subject to civil penalties. Market pressures — Because design consultants and end users are already seeking refrigeration units that comply with DOE and EPA regulations, OEMs who fail to bring viable products to market may face significant business risks. There are many miles ahead of us in this journey, and for many in the industry this is uncharted territory. Emerson is committed effectively navigating this shifting regulatory landscape and helping guide the industry toward the next generation of refrigeration technologies and equipment architectures. Through continued collaboration and innovation, we’ll work with you to create systems that are both economically and environmentally viable. Food retail facilities generate a significant amount of data, with information on key building systems, including HVAC and refrigeration equipment, which can provide an extensive picture of their operations. But, each of these facility systems has its own reporting practices so aggregating and mining the data can be difficult. The Internet of Things (IoT) is enabling better information management and improved diagnostics and control of HVACR systems for retailers. 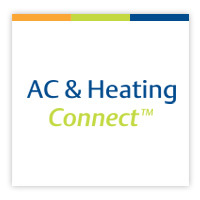 HVACR contractors can use connected technology to their advantage to provide better service. A simple, centralized control platform allows users at all organizational levels to track facility data across multiple sites, providing real-time views into refrigeration, HVAC and lighting systems enterprise-wide. Regardless of size, food retail stores will continue to be populated with legacy equipment and new generations of devices functioning on different operating systems. By connecting the equipment through IoT, HVACR contractors can remotely upgrade these systems with software, reducing time for taking equipment down or swapping out pieces. Technicians will not have to be onsite to make adjustments, resulting in an improved user experience. Contractors can also leverage remote monitoring services to assist in troubleshooting and management of equipment for retail customers. Monitoring centers – like the ProAct Service Center – can remotely process, triage and resolve alarms around-the-clock. Their experts can assess equipment performance to provide timely information on energy expenditure, maintenance costs, refrigerant leaks and shrink causes. Working with food retailers to adopt a solid IoT plan allows real-time troubleshooting and diagnosis of HVACR system issues. Once the connected equipment is installed, retailers will be able to cost-effectively monitor, diagnose and remedy issues quickly while also maintaining uptime, which is critical to meeting customer expectations and building a positive brand reputation. You can read the full HVACR Business article here.